The basic function of the grinding fluid when grinding hard metal is to remove the heat generated in the grinding operation, to lubricate the tools in order to reduce wheel wear, and to remove grits from the grinder. Water based oil in water emulsion and water soluble synthetic lubricants are the most common grinding fluids. But refined neat oil of type white oil is frequently used for grinding of cobolt based hard metal. One of the reasons for this is to avoid skin allergy at water based coolant in which cobolt can be dissolved and also to reduce the wear of the grinder. Water based coolant have some drawbacks such as growth of fungis and bacteria, inferior lubricity, formation of metal soap that clogg the grinding wheel, and it dissolves cobolt which causes health problems. Neat oil has inferior heat removing capacity compared to water based coolant. 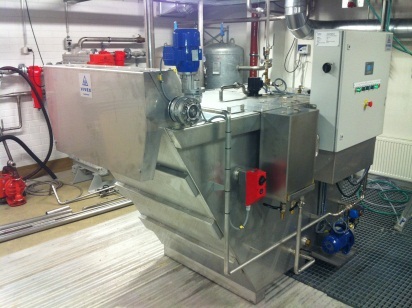 For this reason external chillers are used to enhance the cooling capacity. Particles generated in the grinding operation can be of very small dimension, > 5 µ in diameter. 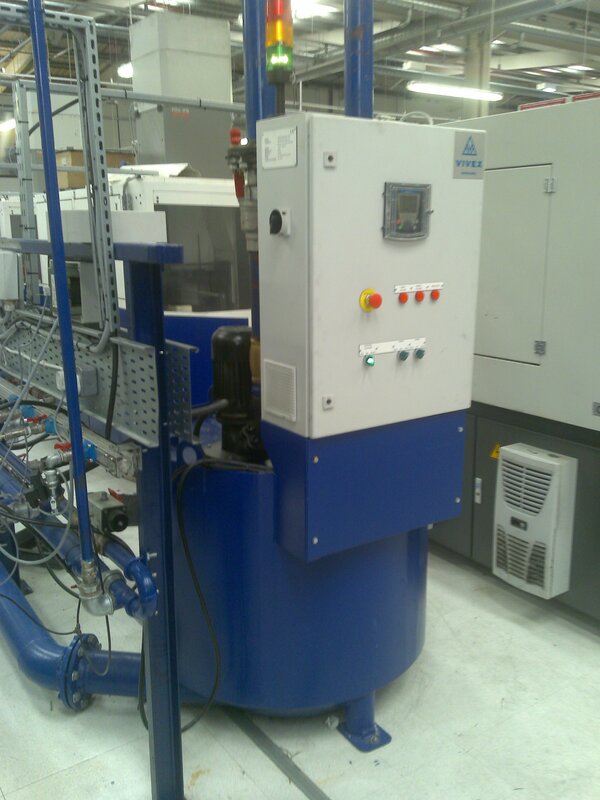 Grinding fluids with high content of particles reduce the grinding speed and muck up the machine tool and coolant tank requiring frequently maintenance. 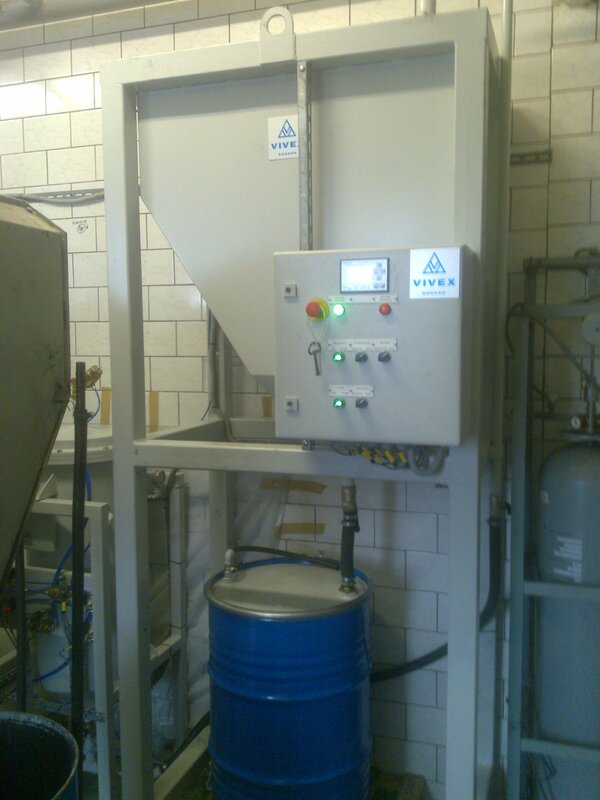 The contaminated fluid from the grinding machine is drained to the self-cleaning return tank of Vortex type (VXRT) from which it is passed to the Decantor system. 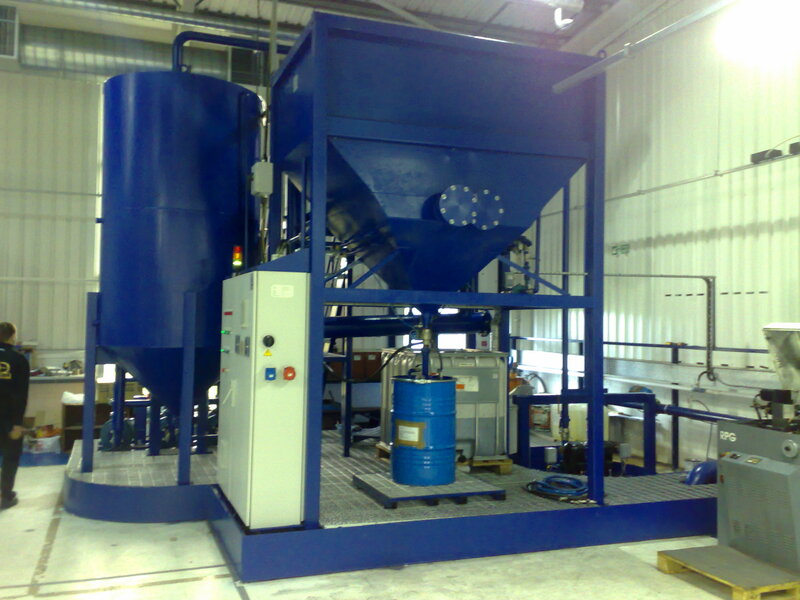 In the Decantor system the coolant is clarified from particles in two separate chambers of lamella package; one in continuous flow separating coarse particles and in the other chamber settling at periodically motionless liquid volume in the lamella package. The fluids from the both chambers are then mixed together and pumped to grinding machines. The particles settled on the lamella plates settles down to the bottom of the Decantor tank and are removed from it by a scraper unit to a sludge de-watering unit. 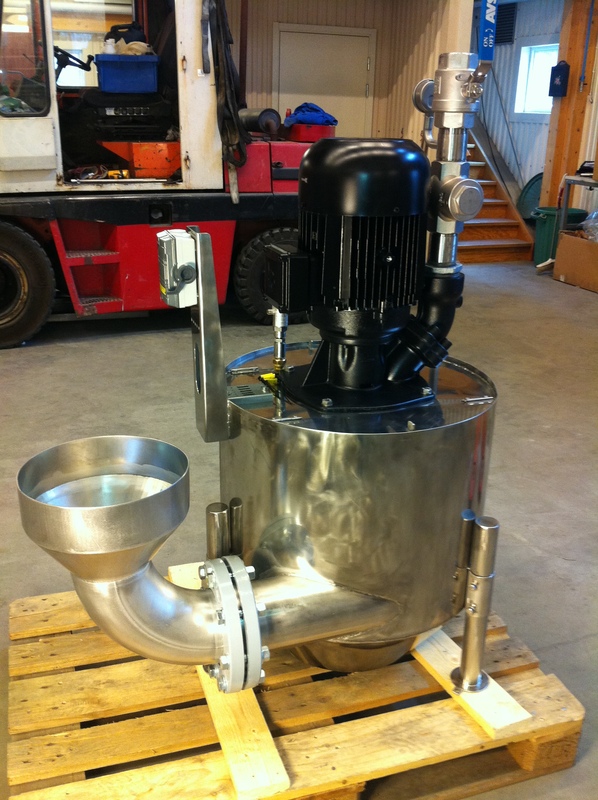 The dewatering unit consists of a modified standard container with a sludge bag (VXDB). Coolant from the dewatering unit is returned to Decantor and reused. When the sludge bag is full, it can easily be lifted by a forklift and be sent for recycling. 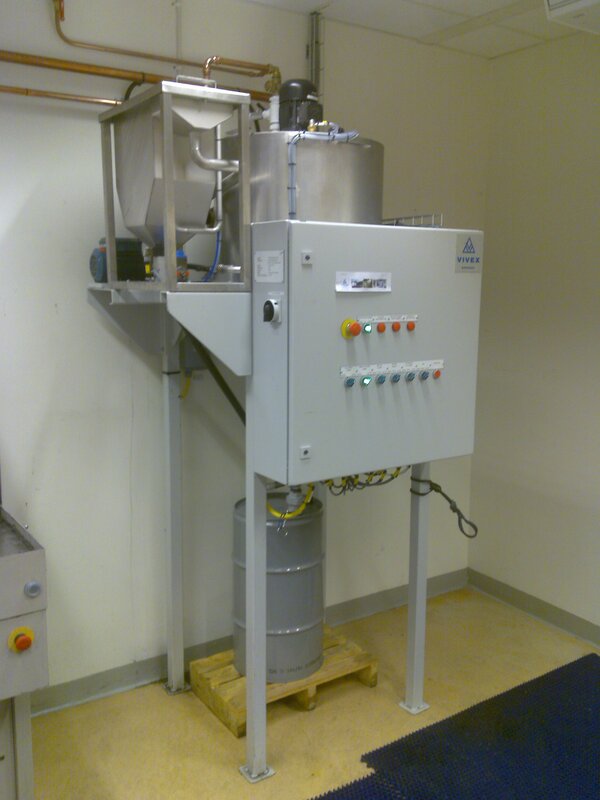 Other Decantor alternative is without scraper but within sludge barrel collecting system. The bottom of the Decantor is connected to a sludge barrel were the sludge is collected. When the barrel is full with sludge the barrel it is exchanged for other new/empty (standard) barrel. Put a lid an the old/full barrel and send it off for recycling, and get paid! Easy maintenance, easy money.